I had never heard of the reality TV cooking show "Chef Roble and Co" when a friend texted me tonight and ordered me to turn on the Bravo channel. As my wife flipped through 400 cable channels trying to find the Bravo channel for the first time I quickly did a Web search to figure out why my friend felt it was so urgent that I tune in. 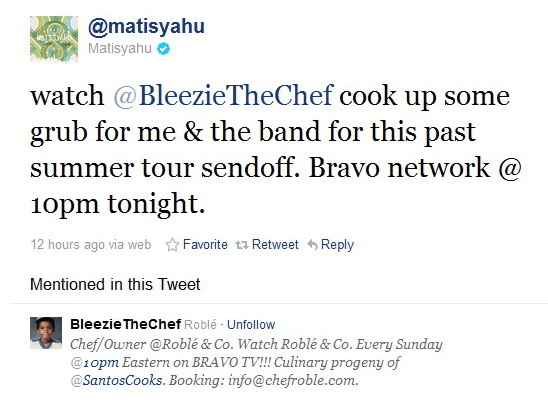 What I found was Chef Roble trying to prepare a meal for the Hasidic singer Matisyahu and a few dozen of his guests before he went away for several months on tour this past summer. The name of the episode was "Babysitter in the Kitchen," which referred to the mashgiach (kosher supervisor) from OK Kosher (a certification agency). 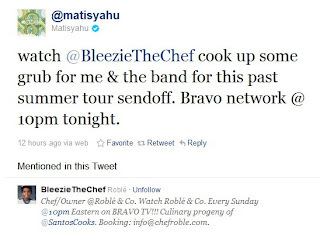 The famous chef (I guess he's famous because he has his own cooking show, but I had never heard of him) not only had to prepare strictly kosher meals for Matisyahu and his guests but they also had to be Thai and Vegan. Oh, and he had to please Matisyahu's whiny mother-in-law and kvetchy wife Tahlia Miller (who doesn't appear to be as strictly Vegan as her husband). I'm guessing that this is the first time on national TV that the intricacies of hashgacha (kosher supervision) were made known in such detail. The OK Kosher mashgiach told the chef that only the mashgiach could light the stoves, but once the pilot light was lit the chef could adjust the flame. However, the mashgiach never provided a reason for this (it's because of bishul akum -- the prohibition on having a non-Jew cook food for Jews). They also showed the mashgiach painstakingly checking each mint leaf for bugs. There were definitely some uncomfortable events that occurred as the catering crew prepared for the sit-down, plated dinner. When they opened the boxes with the kosher plates, they found that each plate was either chipped or dirty (Chef Roble claimed he found human hair on some of the plates, exclaiming "There was DNA on those plates."). Nice!